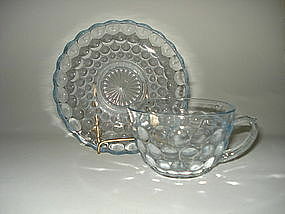 This demi-tasse childs size cup and saucer is in excellent condition with no damage and no repairs. 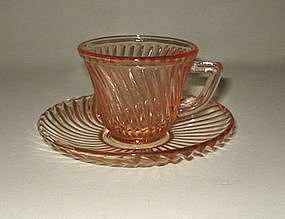 Bright, bold, PINK depression glass in color and made by the Federal Glass Co during the 1930s. A nice start, or addition to your collection! 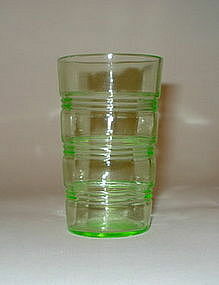 Hocking transparent Green Ring juice tumbler. 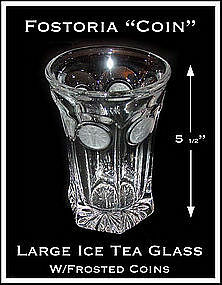 Stands 3 5/8 inches tall, 5 ounce. Mint condition. 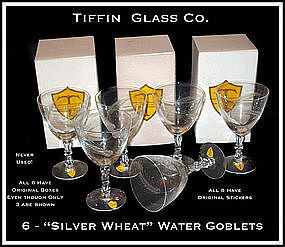 Check our catalog, we have other Hocking and Fireking along with kitchenware items available. Thanks for looking! 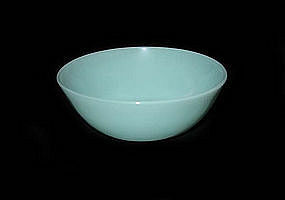 Hocking Fire King Blue Bubble flat soup bowl in MINT unused condition.. no damage and no repairs. 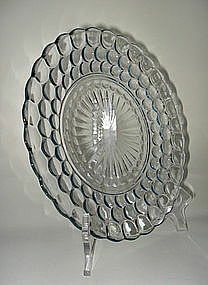 Measures 7 3/4 inches across. Bright, shiny glass. We have other Blue Bubble listed and will gladly combine shipping! Thanks for looking! 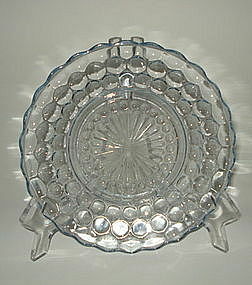 Hocking Fire King Blue Bubble 9 3/8 inch Dinner Plate. MINT unused condition with no damage and no wear. Deep bright blue shine! Check out our other Blue Bubble, we will gladly combine shipping on multiple purchases. Thanks for looking! 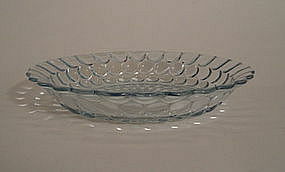 Hocking Blue Bubble 6 3/4 inch salad plate (called a Bread and Butter plate in the reference books). Mint unused condition with no damage and no wear. Thanks for looking! 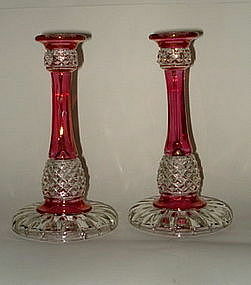 Vintage Cranberry Candlesticks, a pair. 8 1/4 inches tall with a base measuring 4 1/2 inches. 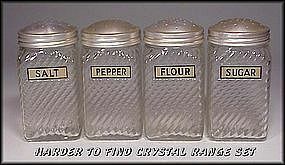 I don't know who made these, but they are heavy, of quality and not new. 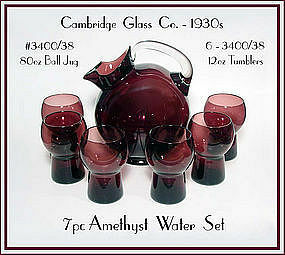 Flashed cranberry, Diamond point pattern, pressed glass. One stick has a tight crack. Smooth but there (see photo) and can be turned to the back as not to see. Everything else is perfect. Deep color with no wear. Thanks for looking! 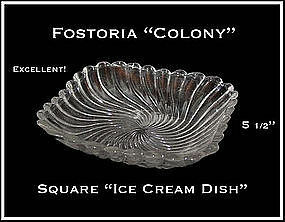 Fostoria Coin with frosted coins, large ice tea glass. No damage no repairs 1 minor mold mark typical with Fostoria. 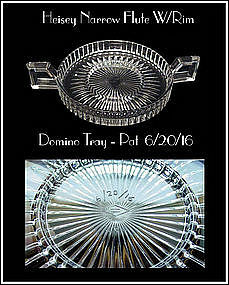 Early Heisey Narrow Flute Domino sugar tray only. Marked Pat - 6/20/16. Creamer sat in cup ring and the individually wrapped Domino sugar cubes sat around the creamer. No damage, no repairs, crystal clear, and no wear. 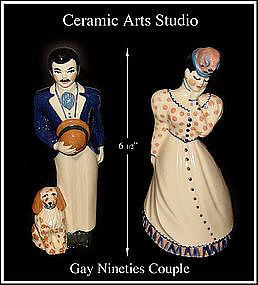 CAS Ceramic Arts Studio Victorian Couple. Excellent condition. No chips, no scratches, no repairs. Unusual colors. Unsigned. 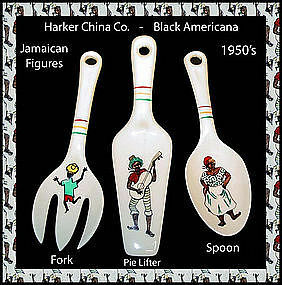 1950's Madison Wisconsin based pottery figures. Excellent condition with no chips, no scratches, and no repairs. 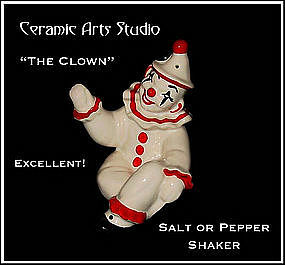 Seated, waving clown salt or pepper shaker in excellent condition. No chips, no scratches, and no repairs. 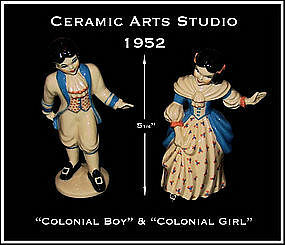 1950's Ceramic Arts Studio figure from Madison Wisconsin.